Some very funny descriptions of British towns. I'll be lending this to my dad. I found this book in my mailbox today. Thank you! I intend to take it to England, when I go on holidays. My aim is to immerse myself in books taking place in or describing the very same country I am discovering at that moment. I imagine peering over the brim of the book to see in front of my eyes what the author has shared with me. Or his view on it anyway. I am looking forward to this! 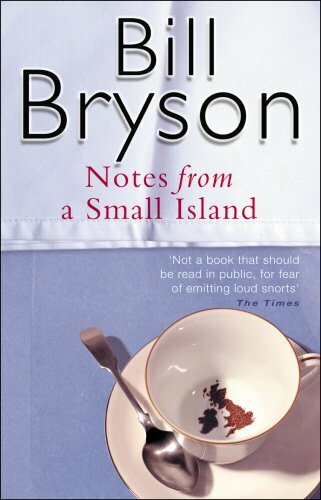 It was immensely interesting and entertatining to read Bryson's view on this coutry while trying to understand it myself. I appreciate England and the British very much and I recognised lots of his views. With pleasure I pass this book on to someone from my country who has lived here for some time. See how she feels about it! Released on Monday, August 11, 2003 at Bliss centre, Stockland in Honiton, Devon United Kingdom. One of the Bliss centre cottages, on the doorstep.